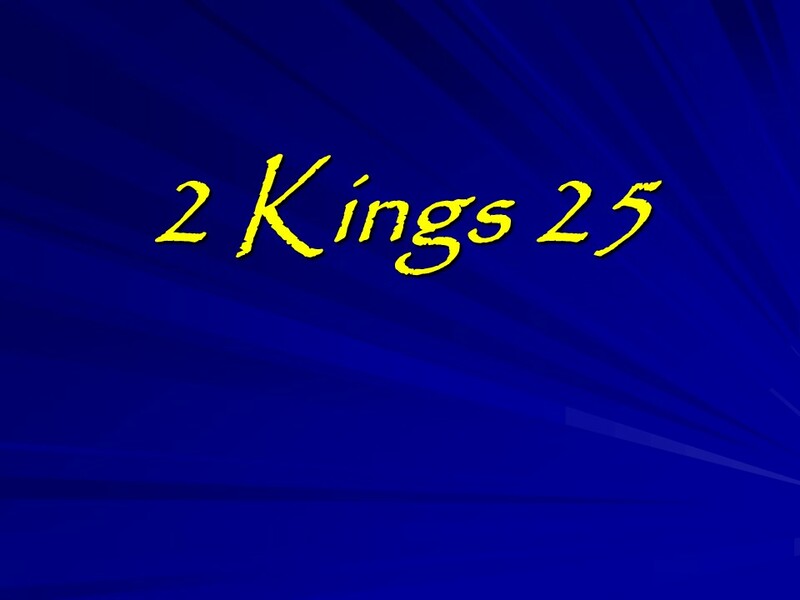 2 Kings – Len Bilén's blog, a blog about faith, politics and the environment. 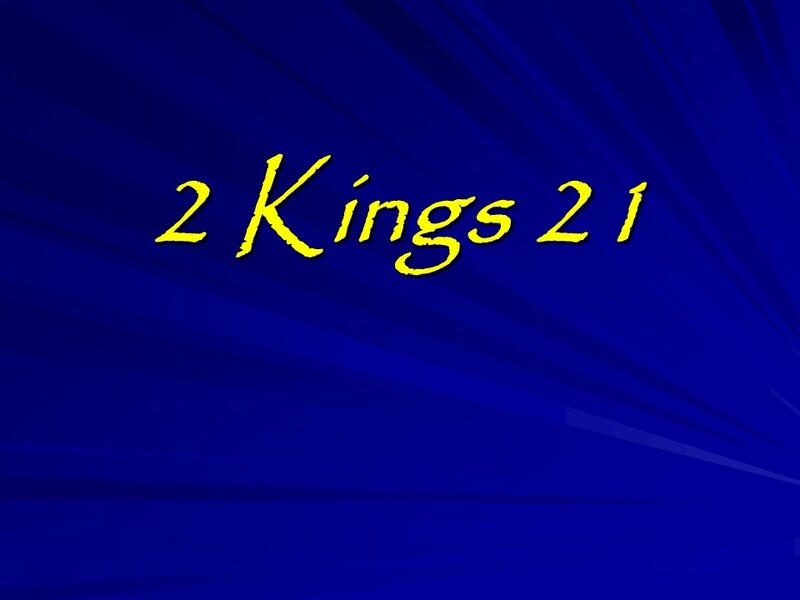 Posted on November 9, 2018 Categories 2 Kings, Bible, faithTags 2 KingsLeave a comment on 2 Kings. 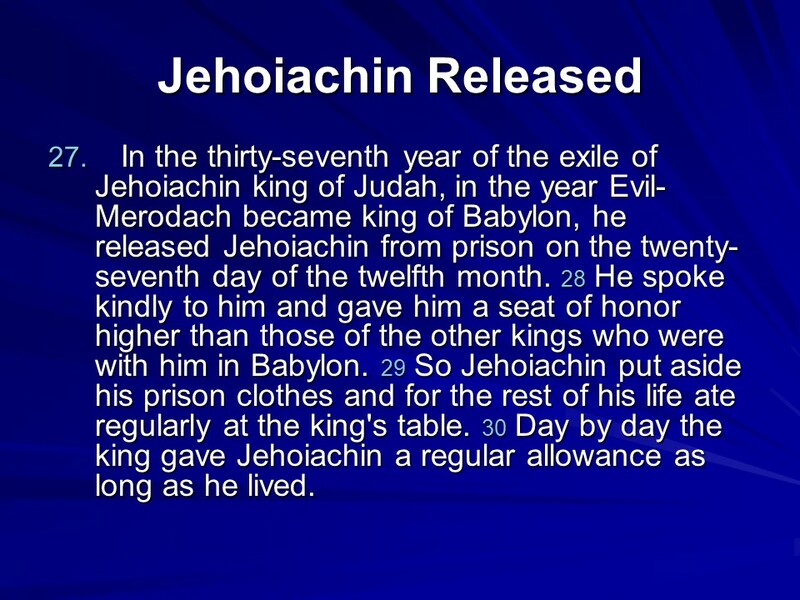 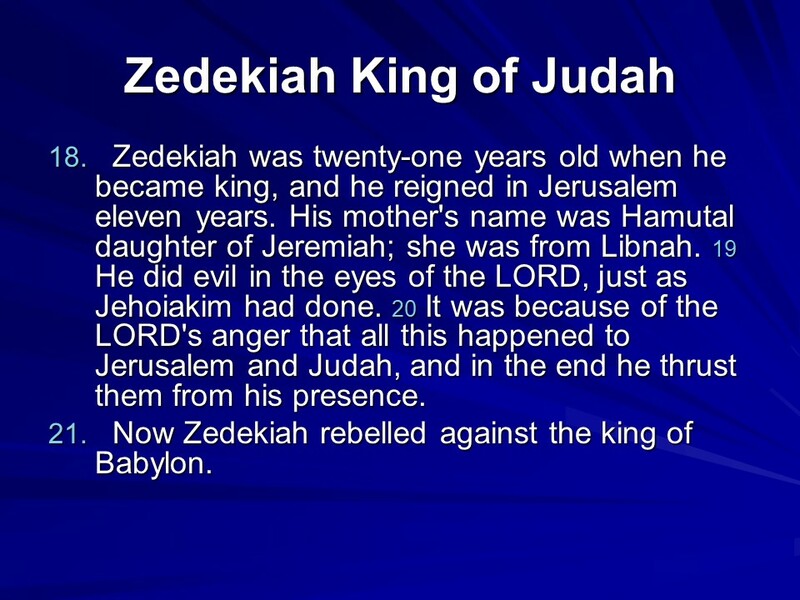 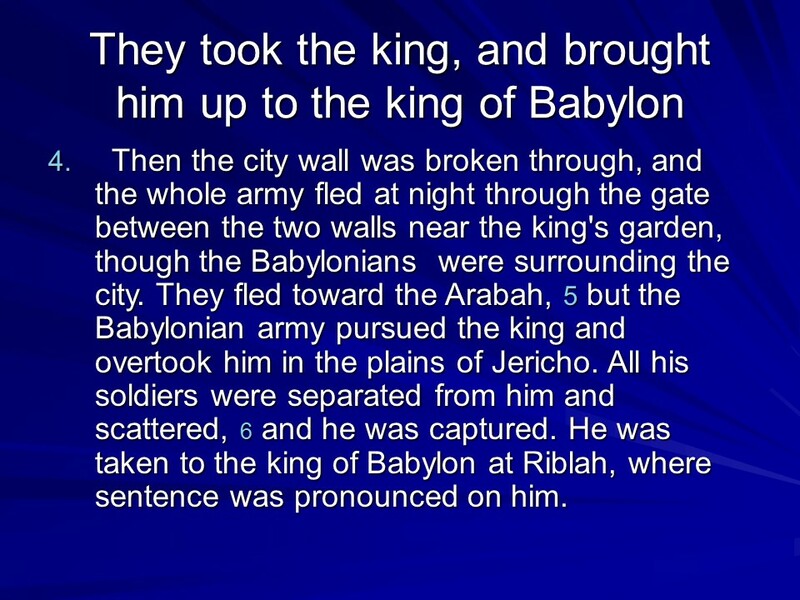 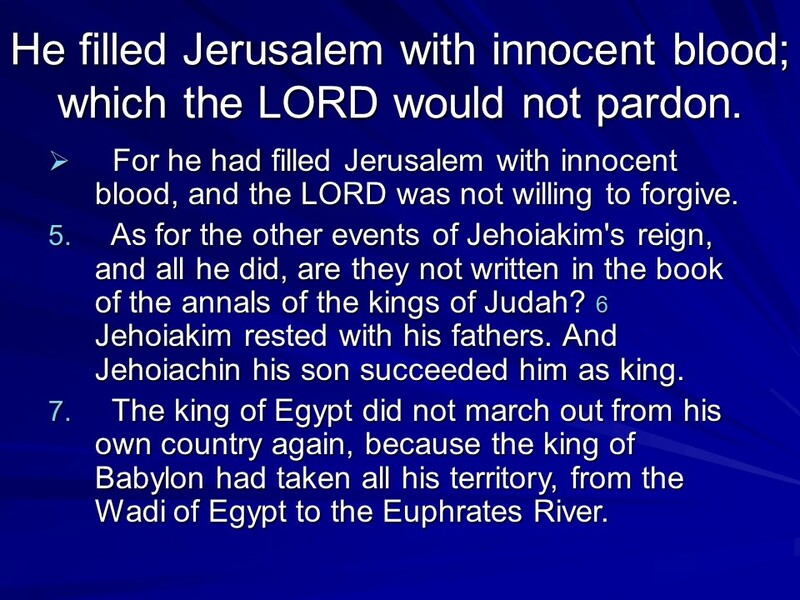 2 Kings 25, The Fall and Captivity of Judah, Gedaliah made Governor of Judah, Jehoiakin Released from Prison. 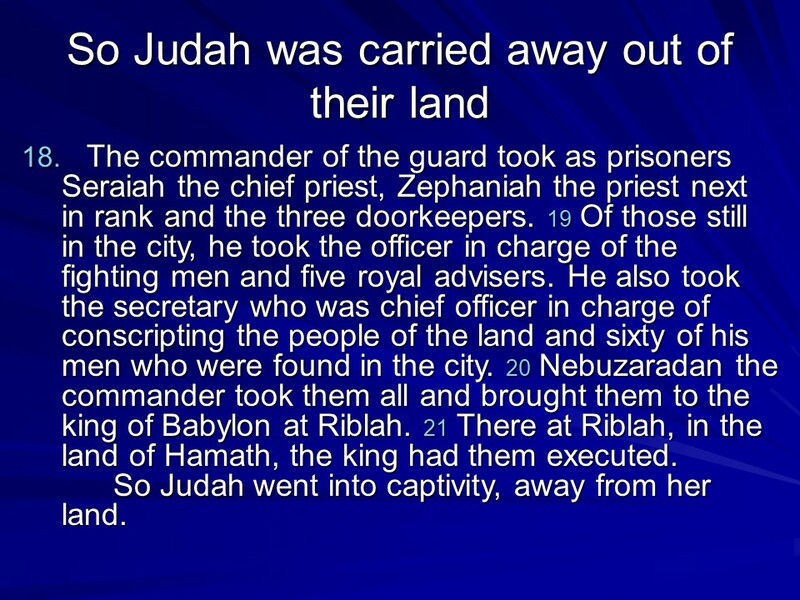 Posted on October 30, 2018 Categories 2 Kings, Bible, faithTags 2 Kings 25, faith, Gedaliah made Governor of Judah, Holy Bible, Jehoiakin Released from Prison, religion, The Fall and Captivity of JudahLeave a comment on 2 Kings 25, The Fall and Captivity of Judah, Gedaliah made Governor of Judah, Jehoiakin Released from Prison. 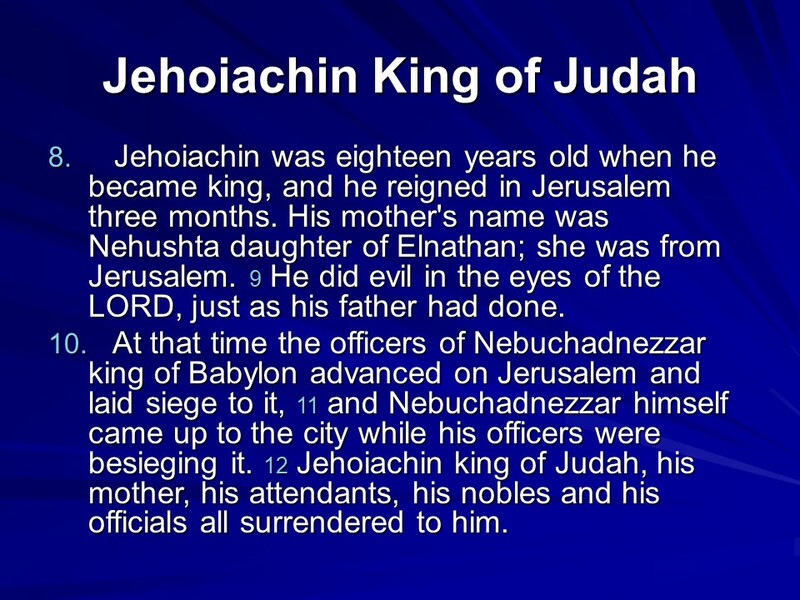 2 Kings 24, Judah Overrun by Enemies, the Reign and Captivity of Jehoiachin, the Fall of Jerusalem, Zedekiah Reigns in Judah. Posted on October 29, 2018 Categories 2 Kings, Bible, faithTags 2 Kings 24, faith, Holy Bible, Judah Overrun by Enemies, religion, the Fall of Jerusalem, the Reign and Captivity of Jehoiachin, Zedekiah Reigns in JudahLeave a comment on 2 Kings 24, Judah Overrun by Enemies, the Reign and Captivity of Jehoiachin, the Fall of Jerusalem, Zedekiah Reigns in Judah. 2 Kings 23, Josiah Restores the Worship, Impending Judgment on Judah, Josiah Dies in Battle, the Reign and Captivity of Jehoahaz, Jehoiakim Reigns in Judah. 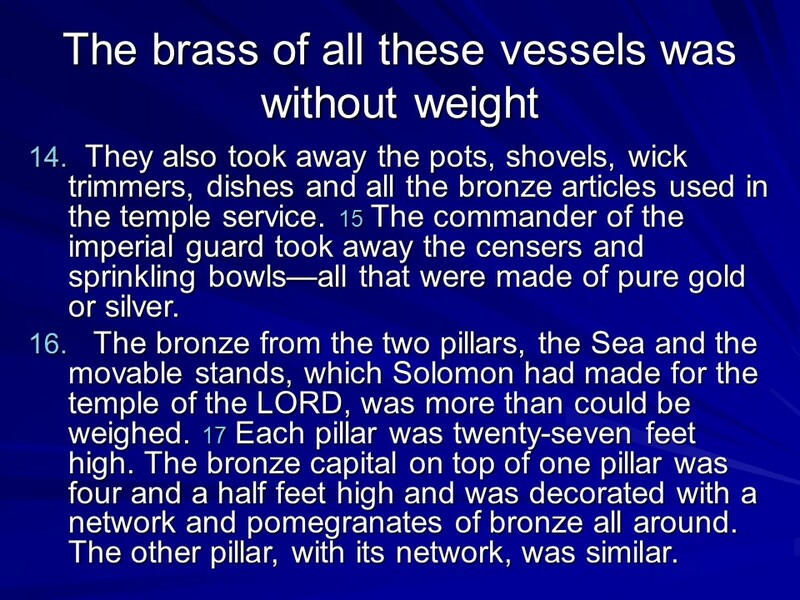 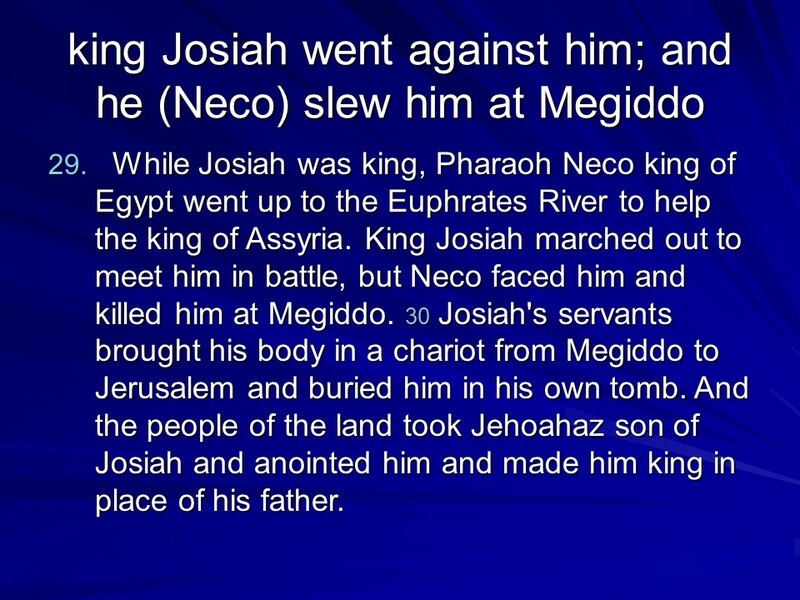 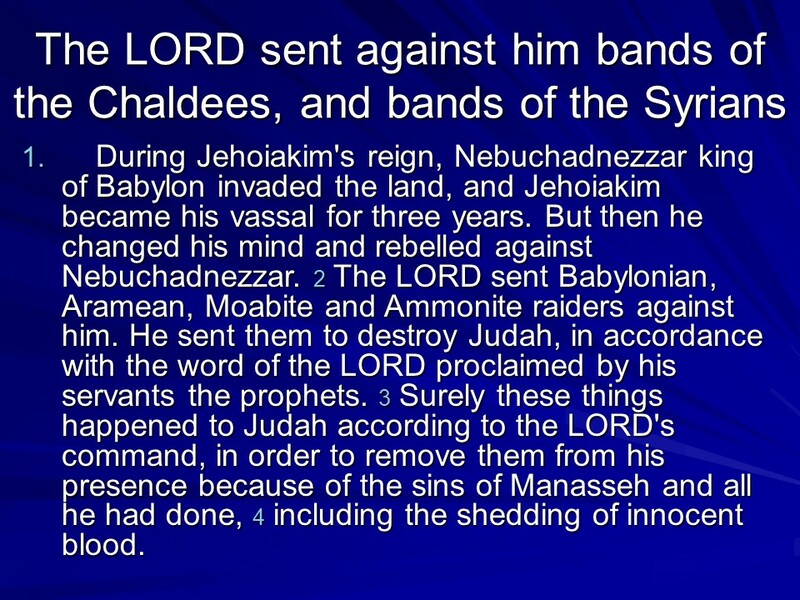 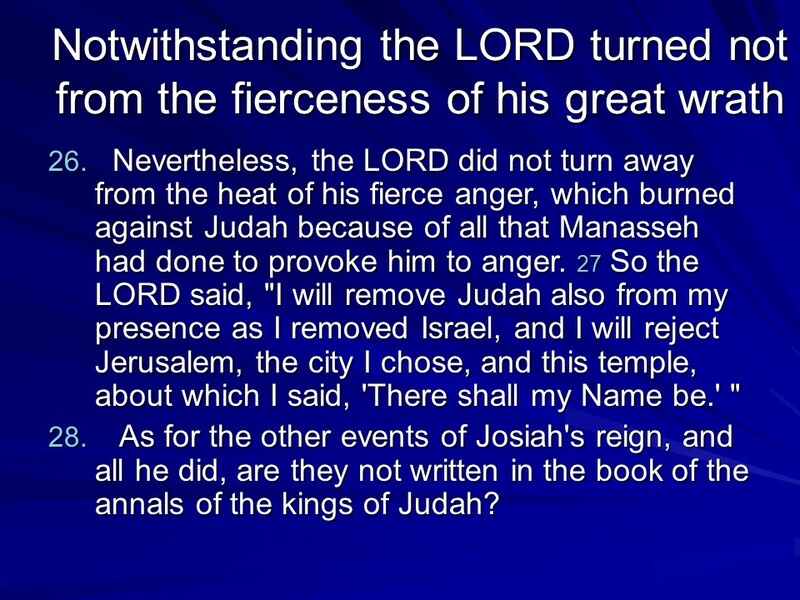 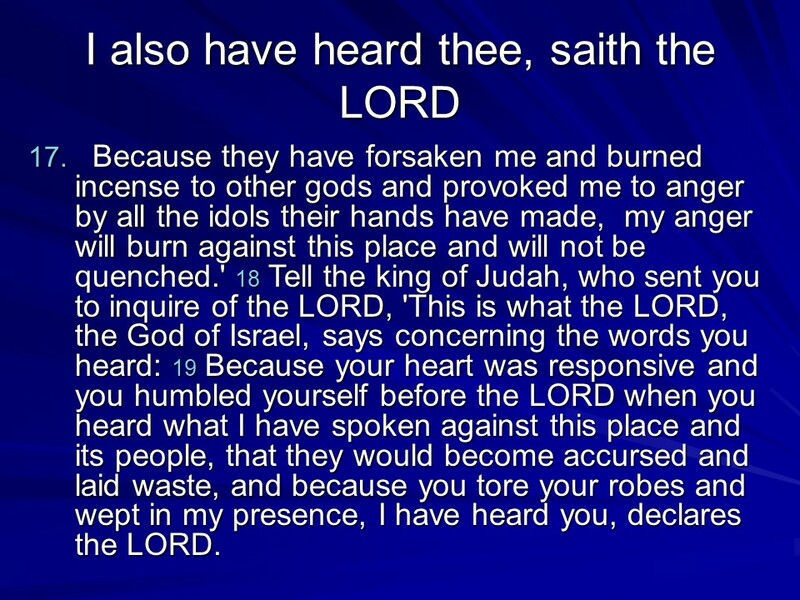 Posted on October 28, 2018 Categories 2 Kings, Bible, faithTags 2 Kings 23, faith, Holy Bible, Impending Judgment on Judah, Jehoiakim Reigns in Judah, Josiah Dies in Battle, Josiah Restores the Worship, religion, the Reign and Captivity of JehoahazLeave a comment on 2 Kings 23, Josiah Restores the Worship, Impending Judgment on Judah, Josiah Dies in Battle, the Reign and Captivity of Jehoahaz, Jehoiakim Reigns in Judah. 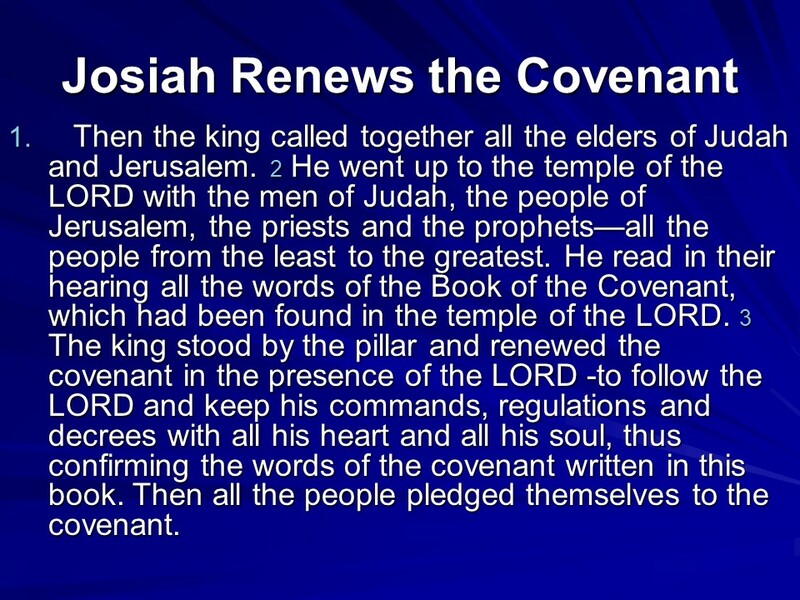 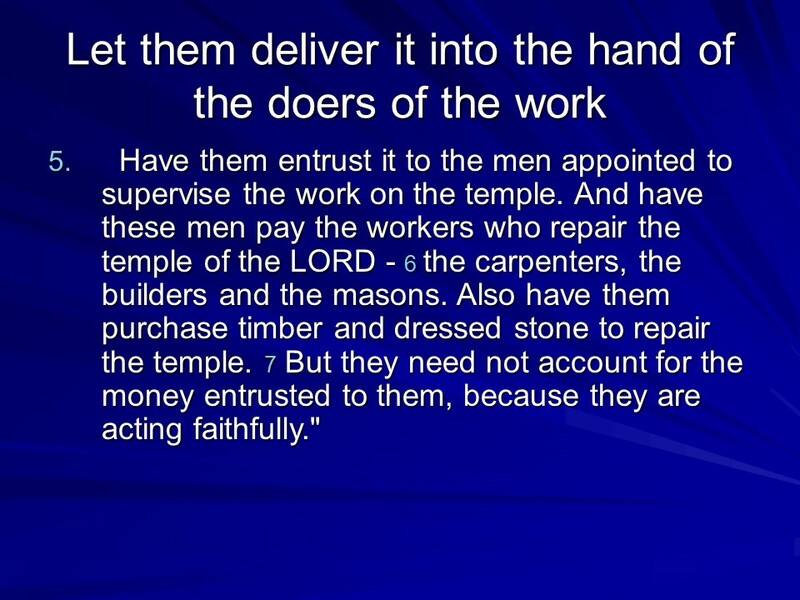 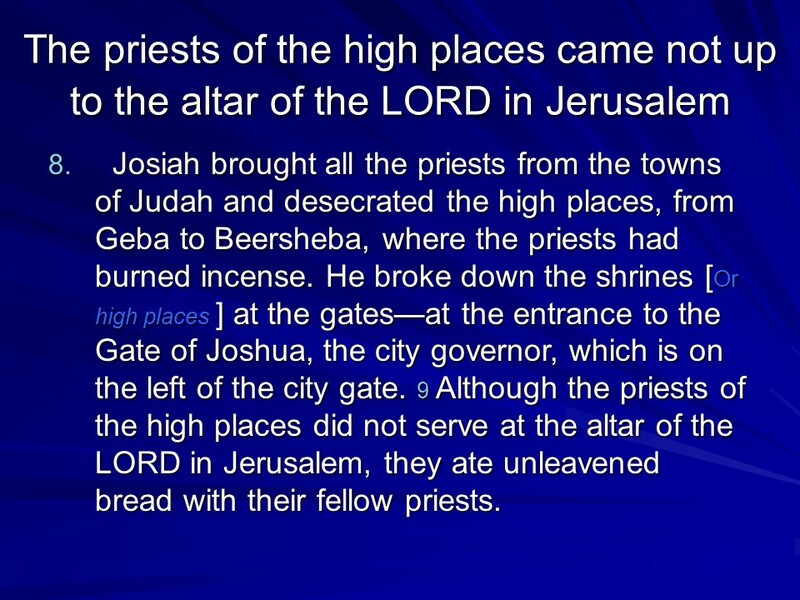 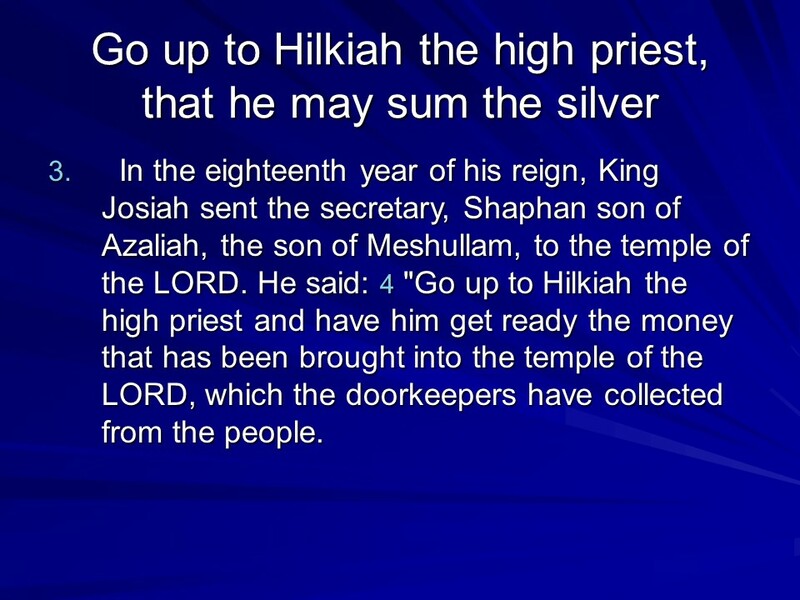 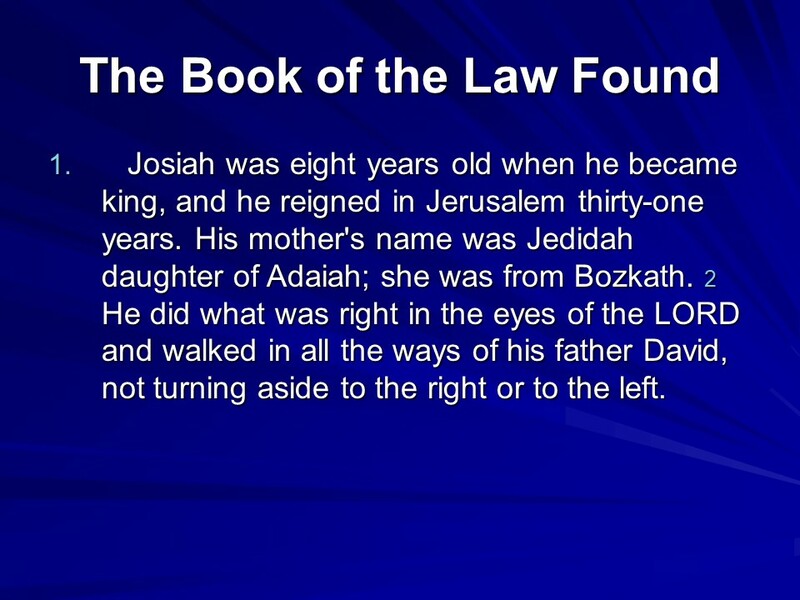 2 Kings 22, Josiah Reigns in Judah, Hilkiah Finds the Book of the Law. 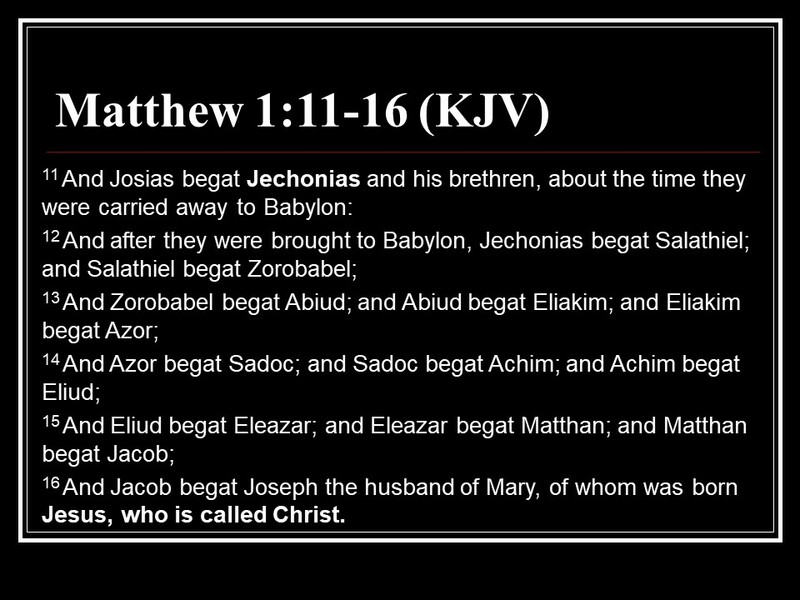 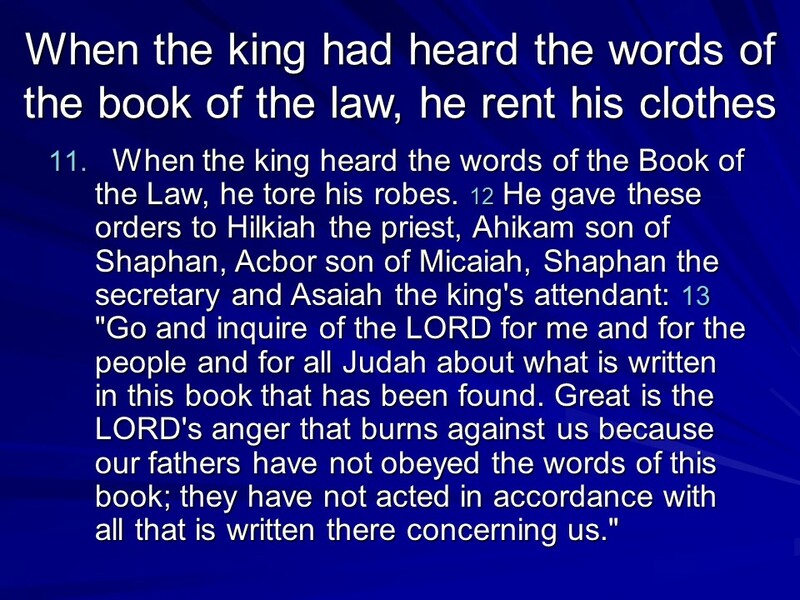 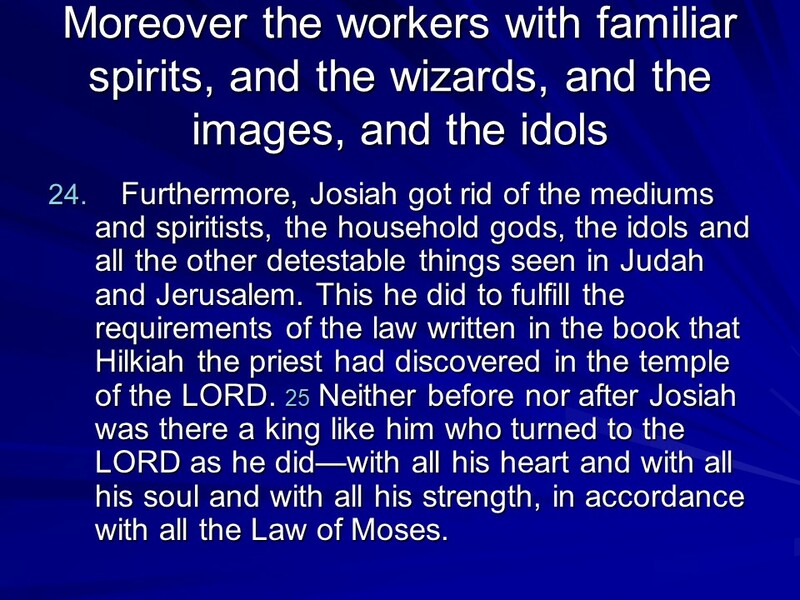 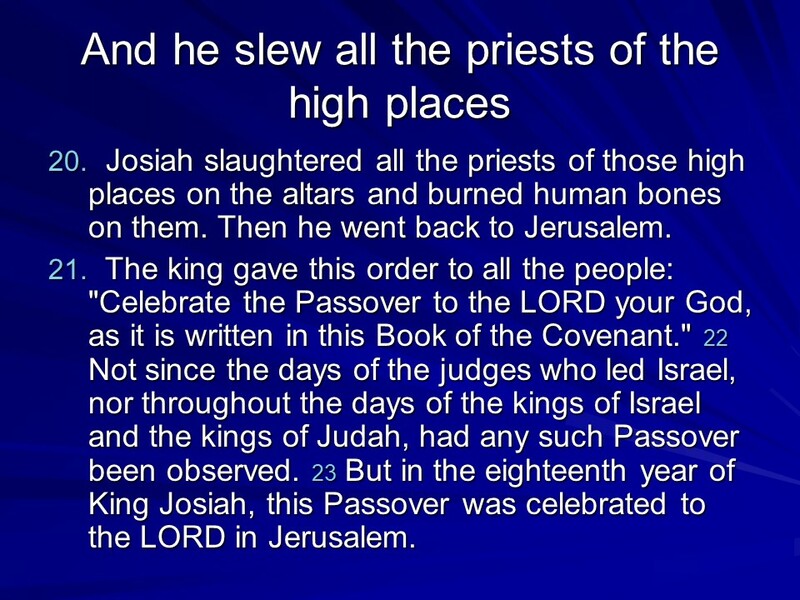 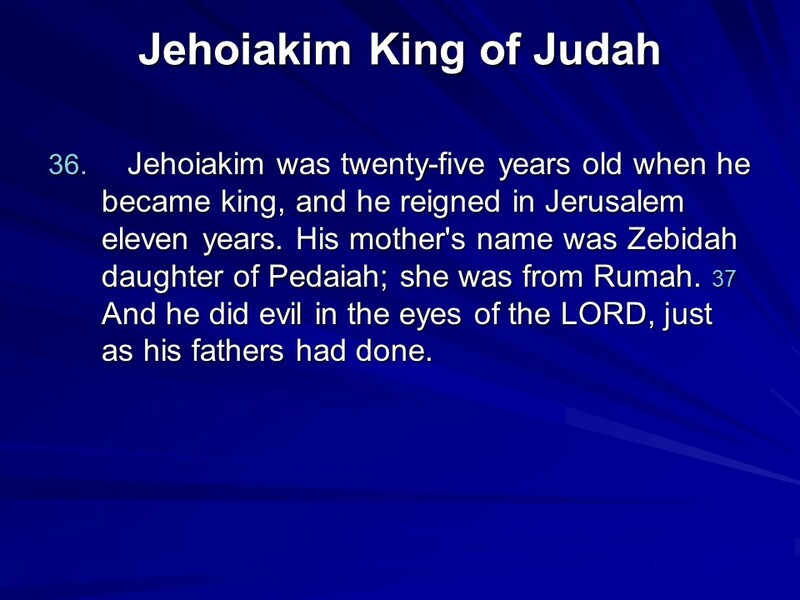 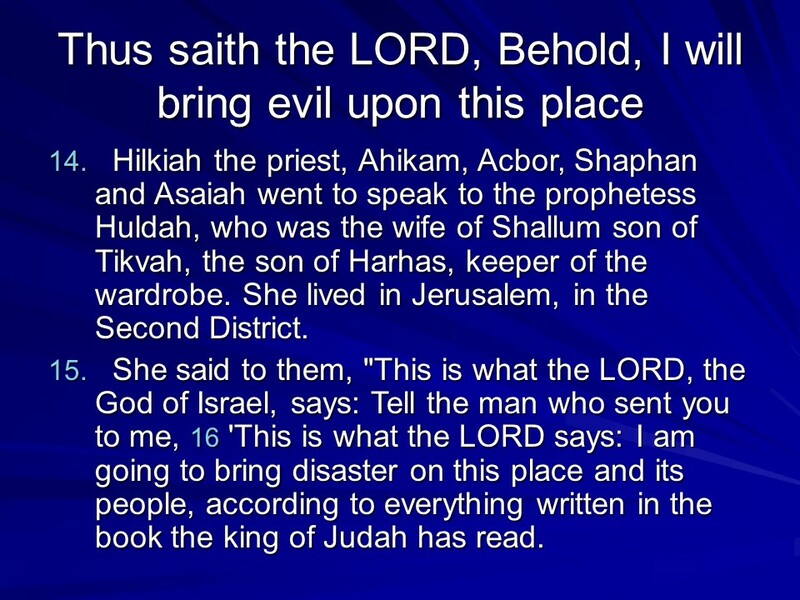 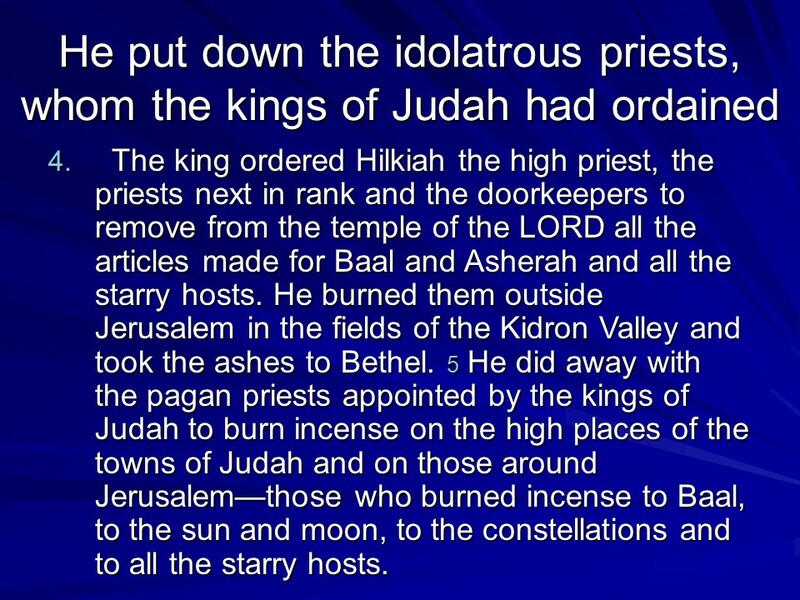 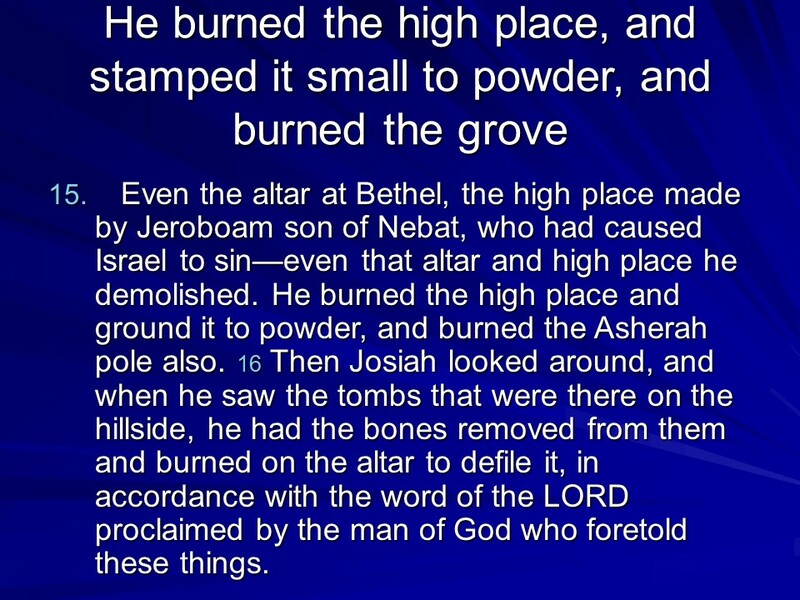 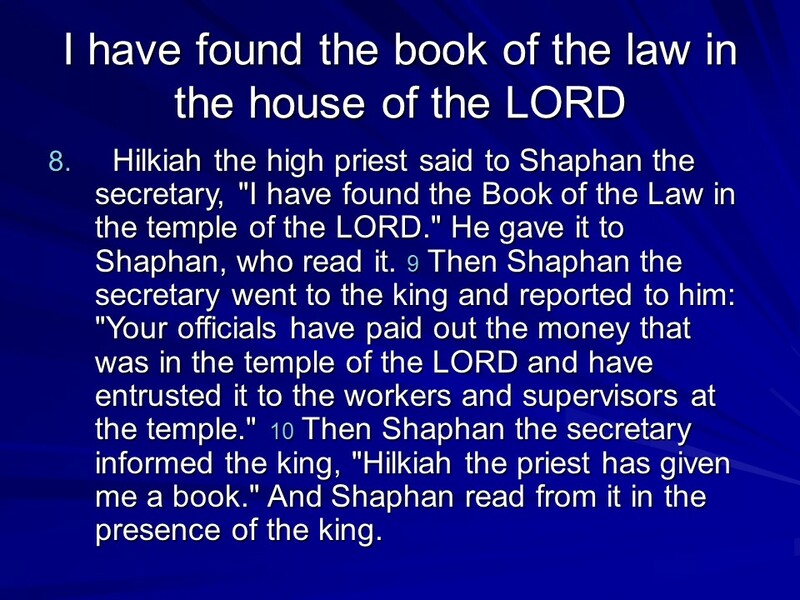 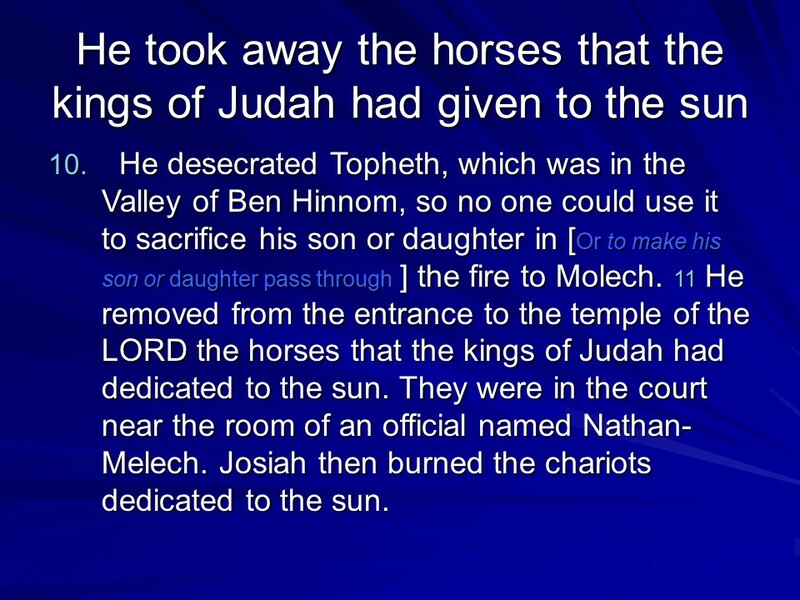 Posted on October 27, 2018 Categories 2 Kings, Bible, faithTags 2 Kings 22, faith, Hilkiah Finds the Book of the Law, Holy Bible, Josiah Reigns in Judah, religionLeave a comment on 2 Kings 22, Josiah Reigns in Judah, Hilkiah Finds the Book of the Law. 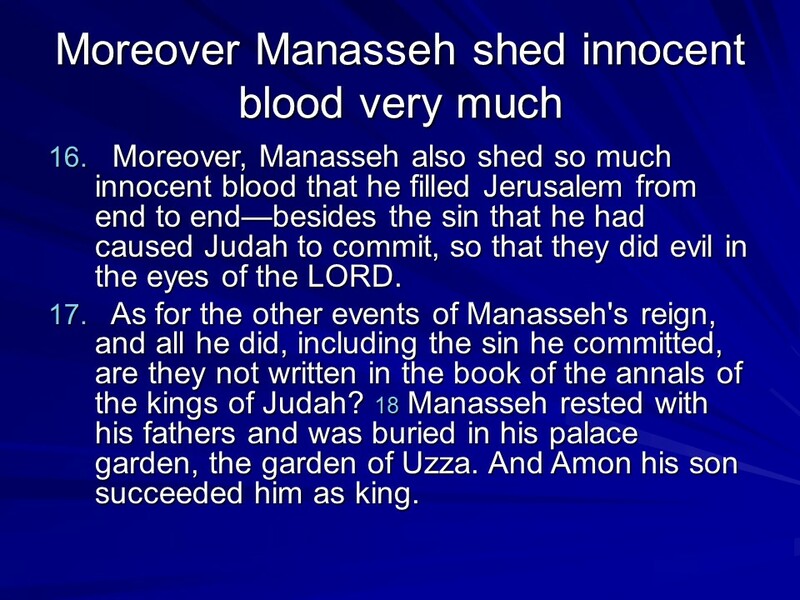 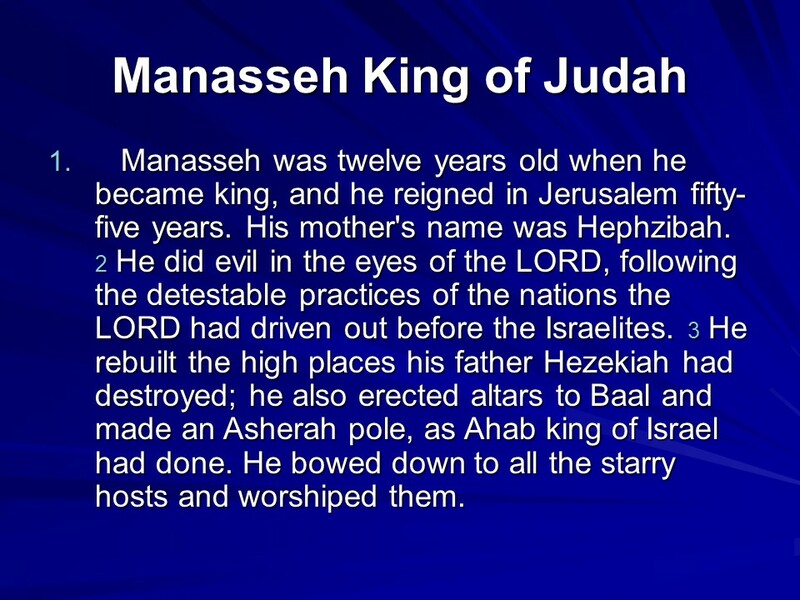 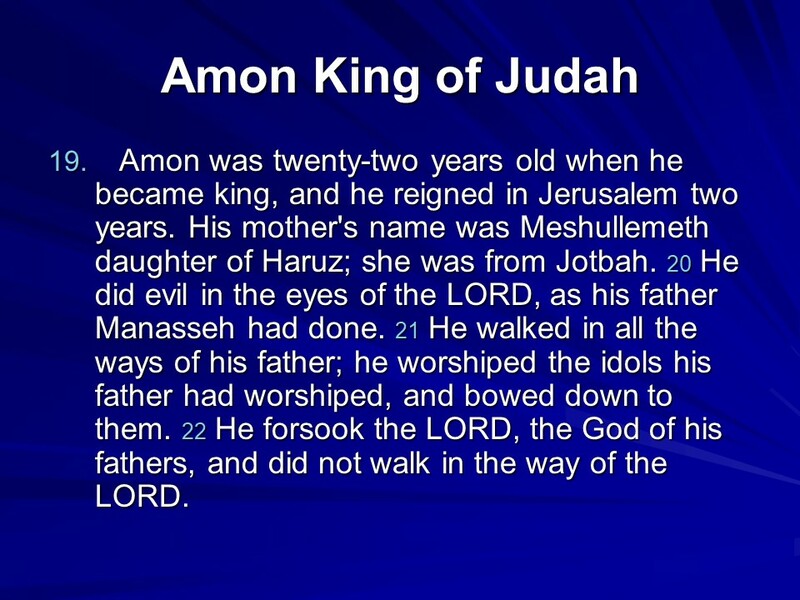 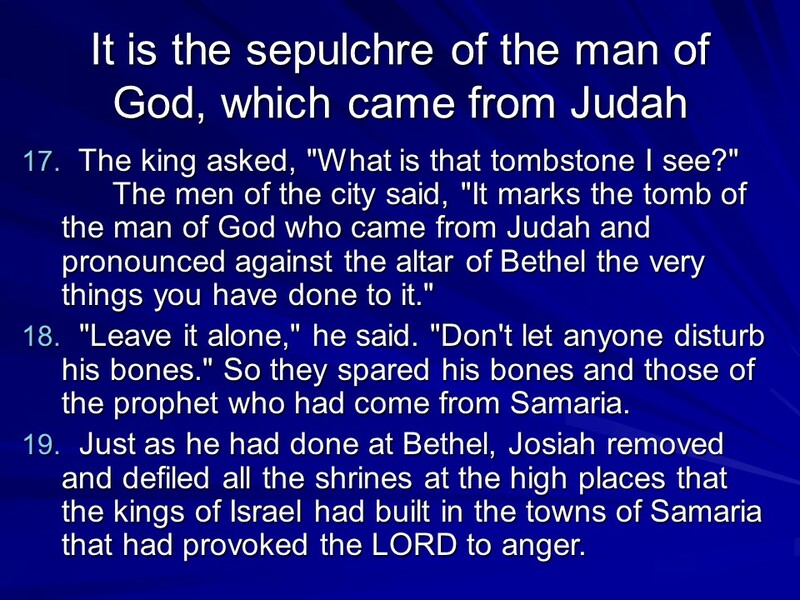 2 Kings 21, Manasseh Reigns in Judah, Amon’s Reign and Death. 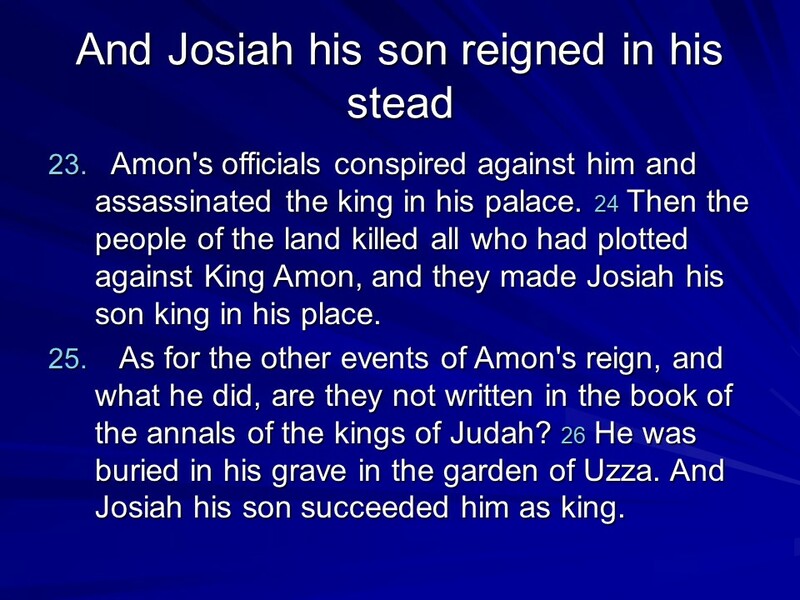 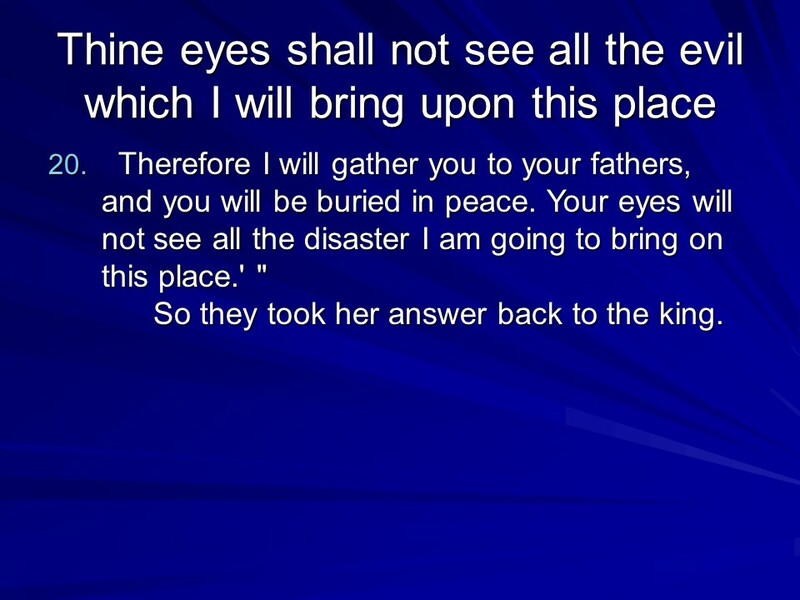 Posted on October 26, 2018 Categories 2 Kings, Bible, faithTags 2 Kings 21, Amon's Reign and Death, faith, Holy Bible, Manasseh Reigns in Judah, religionLeave a comment on 2 Kings 21, Manasseh Reigns in Judah, Amon’s Reign and Death. 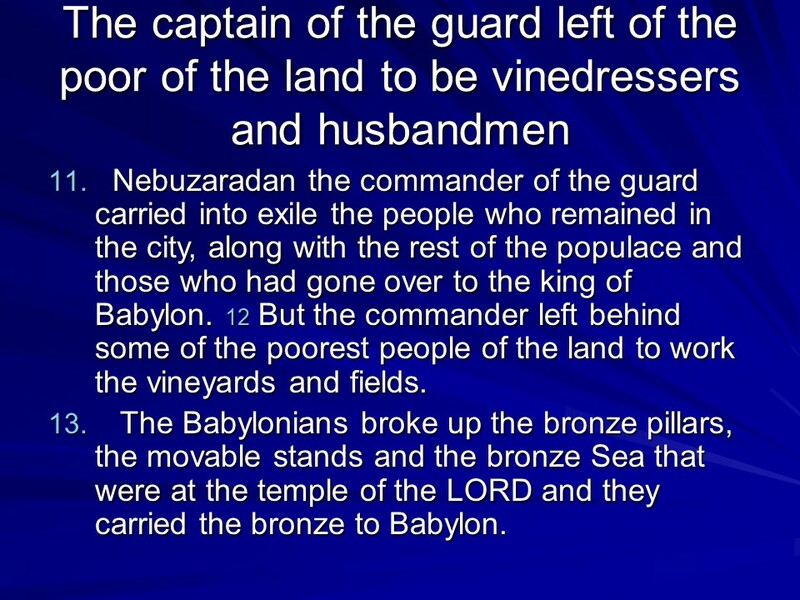 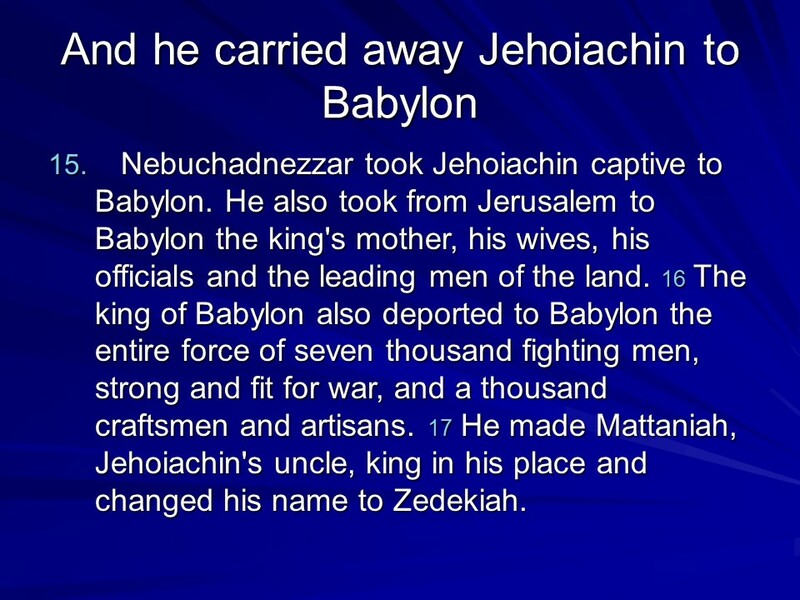 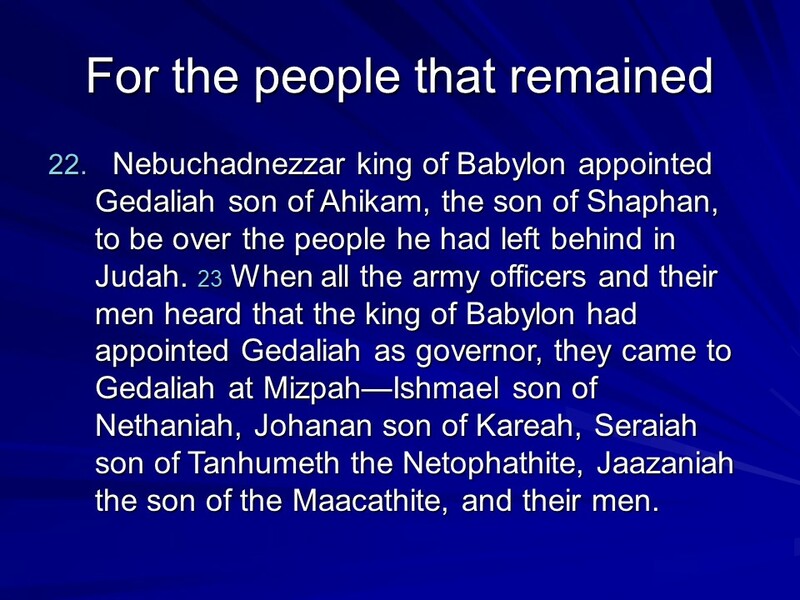 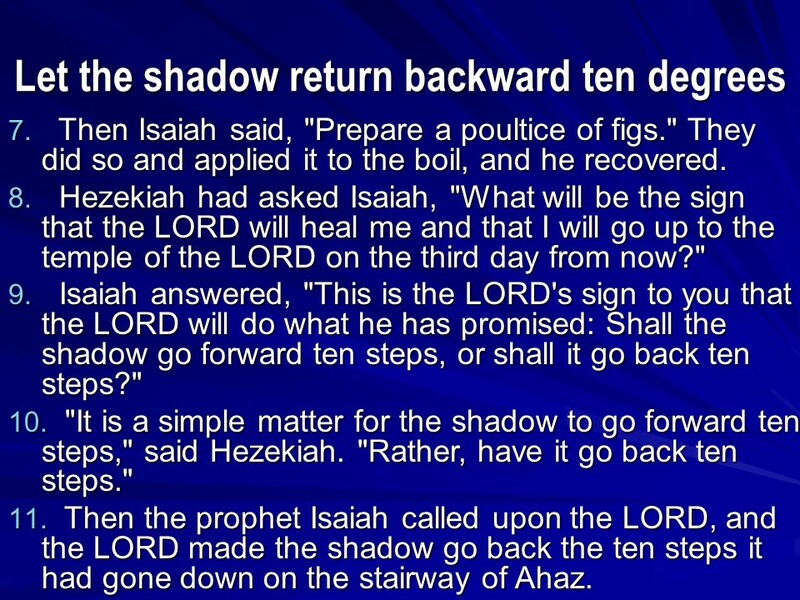 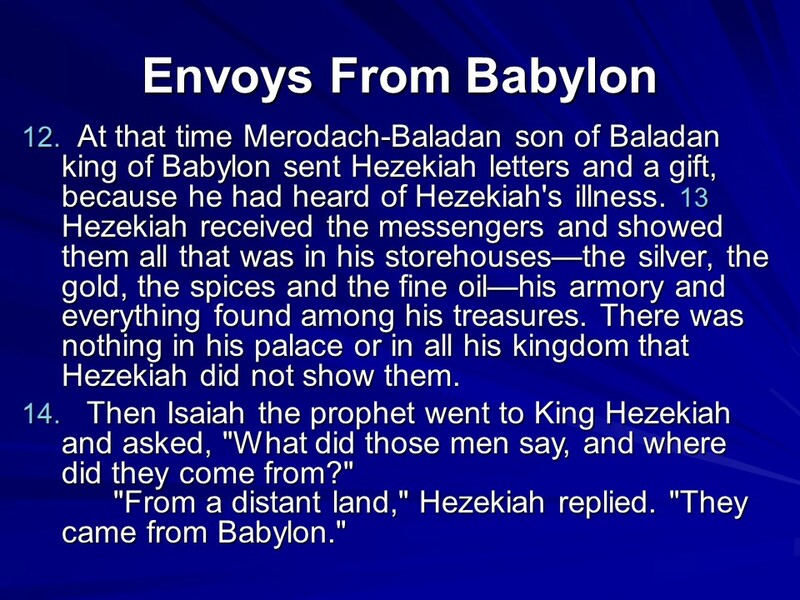 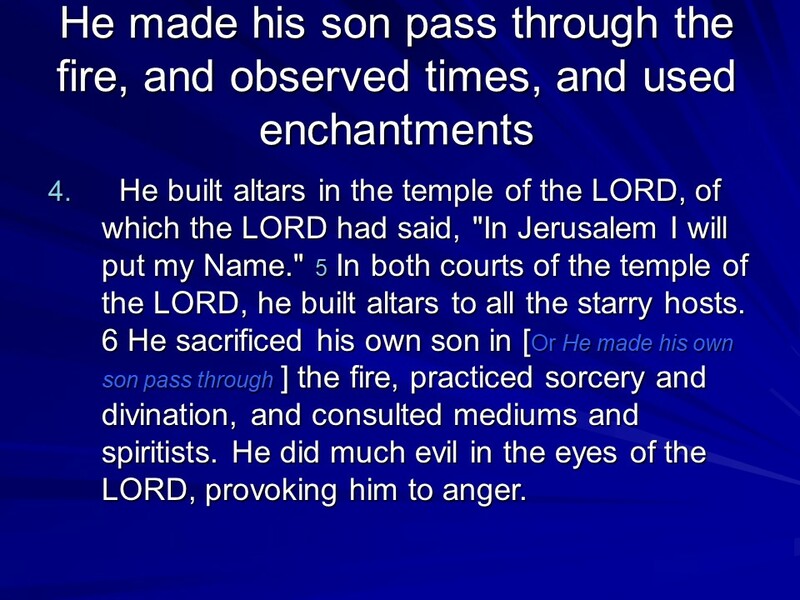 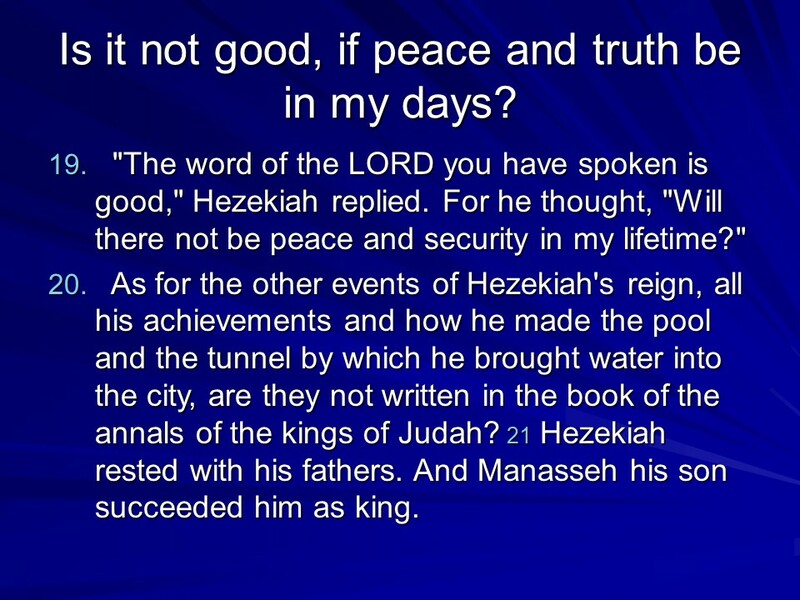 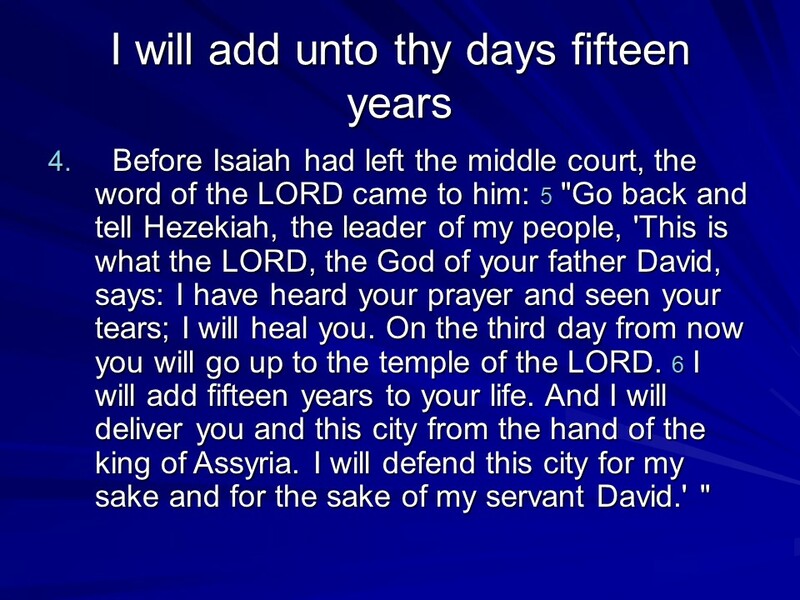 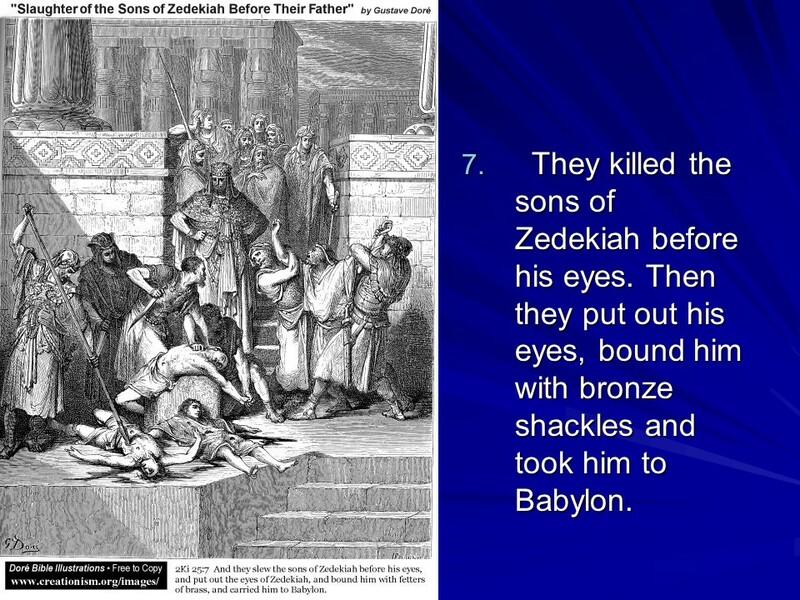 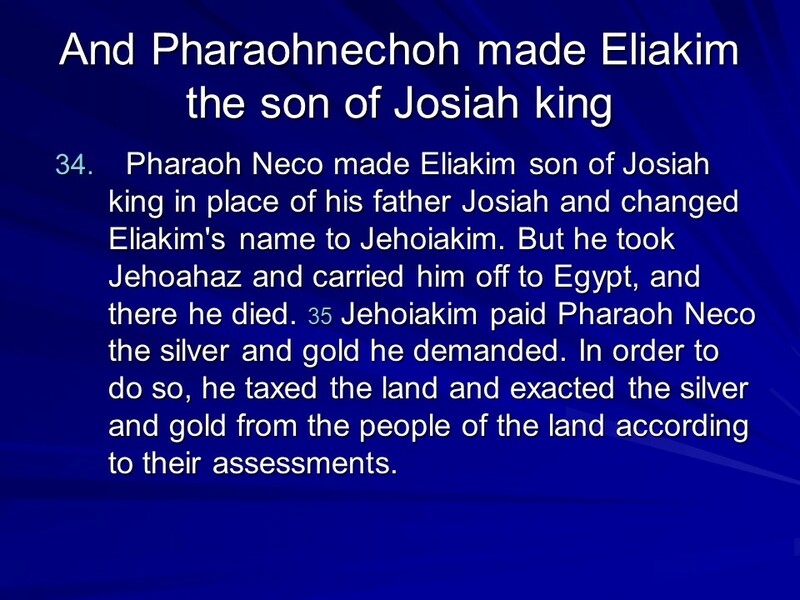 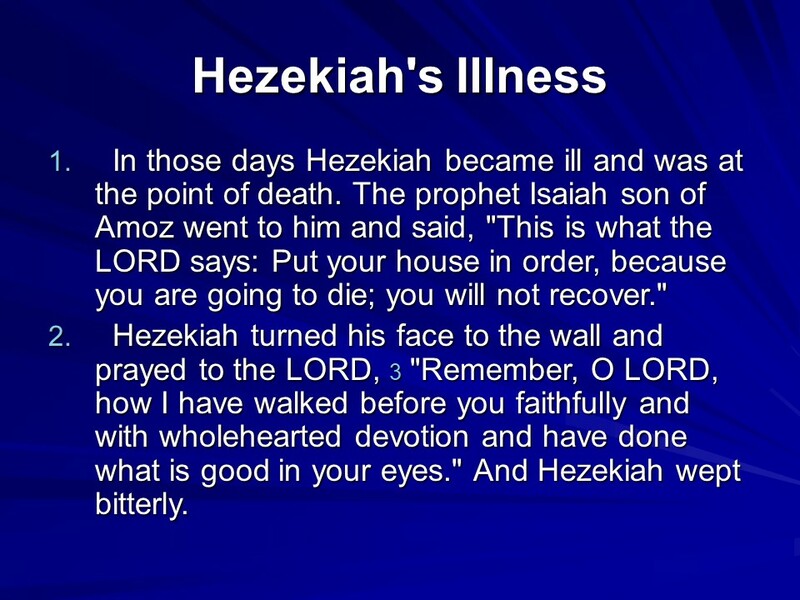 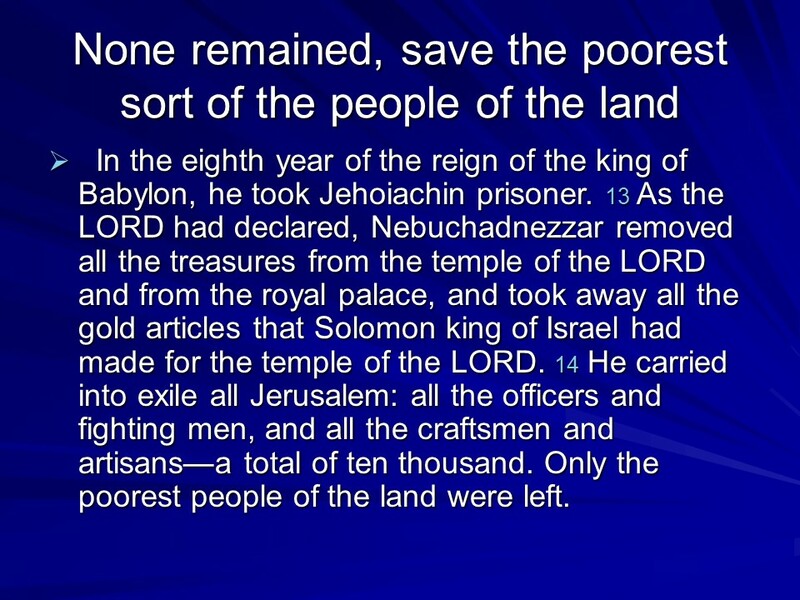 2 Kings 20, Hezekiah’s Life Extended, The Babylonian Envoys, Hezekiah’s Death. 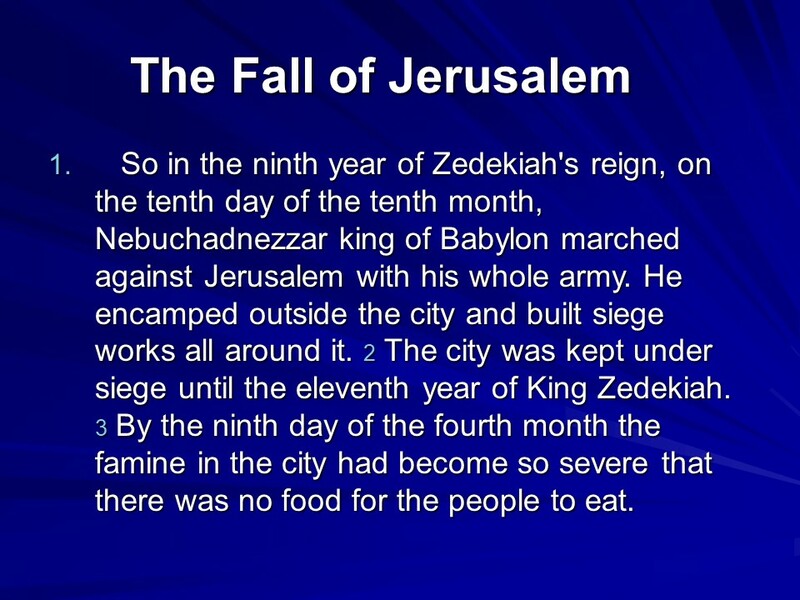 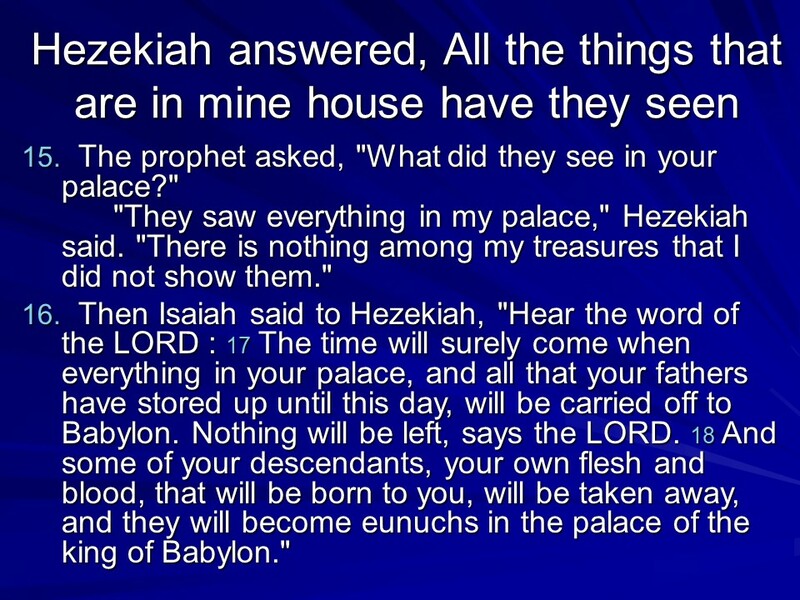 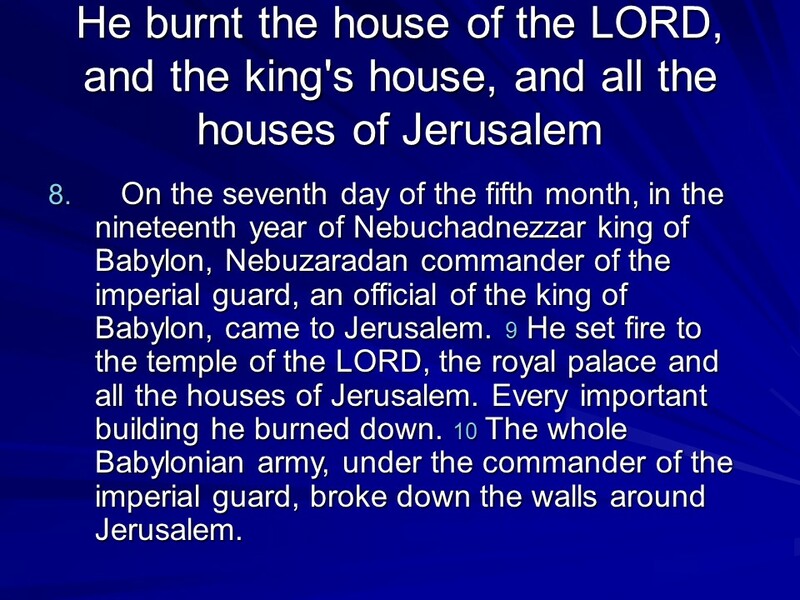 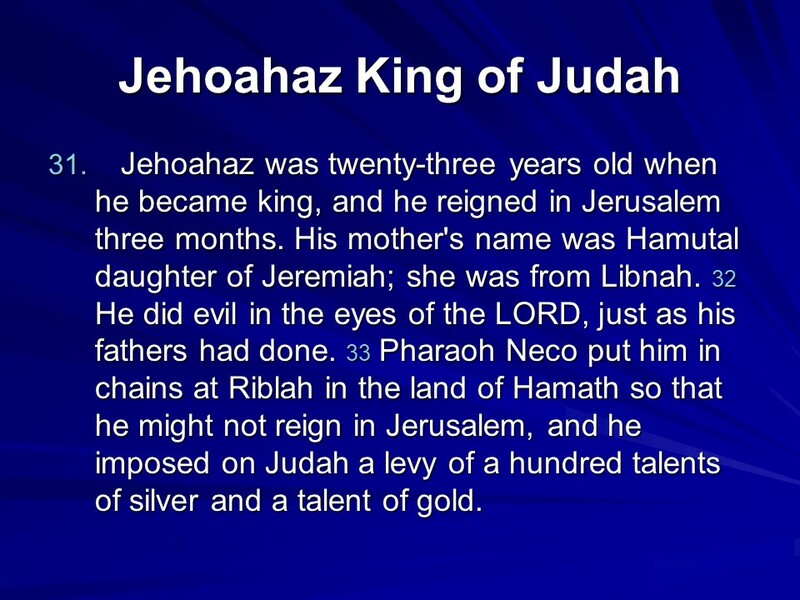 Posted on October 25, 2018 Categories 2 Kings, Bible, faithTags 2 Kings 20, faith, Hezekiah's Death, Hezekiah's Life Extended, Holy Bible, religion, The Babylonian EnvoysLeave a comment on 2 Kings 20, Hezekiah’s Life Extended, The Babylonian Envoys, Hezekiah’s Death.